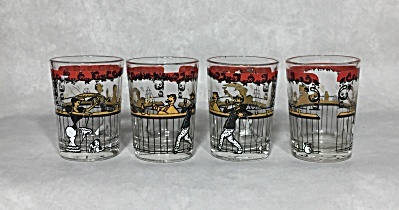 The red and black band around the top part of each glass are like a stage curtain highlighting the black slat wooden bar behind which a mustachioed bartender is mixing drinks. To his right is a dapper gentleman customer holding a drink and standing next to a brass spittoon. To the left of the bartender is a lady raising her glass. She is wearing a bustle and carrying a parasol. A dog is near her feet. Hey, wait a minute, what is a lady doing in a saloon? These glasses are signed with the Hazel Atlas logo thus identifying the maker. Get your craft or classic cocktail recipes ready!